Check out the VXRSI Roots Brazil Shirt! As a part of their “Roots of Fight” series, VXRSI pays tribute to the origins of martial arts that have helped shape the MMA world. In this taking, we have the VXRSI Brazil Shirt. 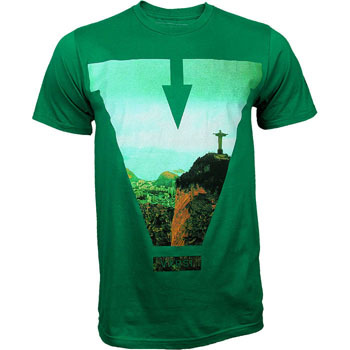 The VXRSI Roots Brazil Shirt put a spotlight on Rio de Janeiro, as it features an overhead shot of the city and the ever-so-famous Christ statue. This shirt comes in Kelly Green, and features a Brazilian flag patch on one sleeve and the Brazilian crest on the other. The VXRSI Roots Brazil Shirt is available at MMA Warehouse .